business. Do you wonder what a man thinks about? Well, right off I marvel at the beauty & magnitude of the heavens; I think to myself, isn't it wonderful out here under the stars in God's great outdoors. The light of New Orleans blink in the distance, it is a fascinating sight. I breathe deeply and change the position of my gun--it is good to be alive. Snatches of poetry come to mind--I struggle vainly to remember their entirety. Emerson's poem that Uncle Chas sent me stands out in full, however. I say it through a few times, marveling at its beauty, and the thought behind it. More often than not Biblical stories and verses command my thinking--91st & 23rd Psalms, the Lord's prayer, other old favorites--always comforting, always applicable, always practical if understood. Soon, however, my legs get tired, just standing around, the wind seems to get colder, the gun heavier, and I begin to wonder if the relief is every going to show. Perhaps, this will give you some idea of what standing a watch involves. Of course you have to challenge everyone who comes on or near your post and make certain they are friendly, etc. 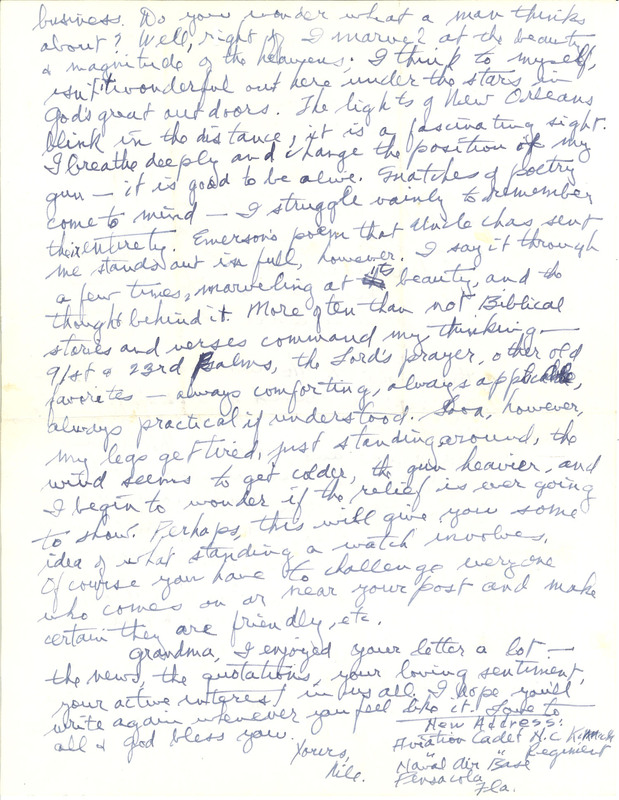 Grandma, I enjoyed your letter a lot--the news, the quotations, your loving sentiment, your active interest in us all. I hope you'll write again whenever you feel like it. Love to all & god bless you. Yours, Nile New Address: Aviation Cadet N.C. Kinnick " " Regiment Naval Air Base Pensacola Fla.